About Us | GreenandSave.com | Green News, Tips, and Services for saving money, energy and the planet. GREENandSAVE has been an influential player the "green" energy intelligence marketplace since 2007. The whole organization is dedicated to helping Americans grow stronger, maintain our coveted high standard of living, and serve as better stewards of the environment. The company drives initiatives that range from saving money for home and business owners to continuing education and re-training for new careers in the green economy. GREENandSAVE is also a communications catalyst through its GREEN NEWS division, and we welcome Contributing Writers. Our team also welcomes strategic partnerships with companies such as Independence LED Lighting, Revolution Energy Group, and Local Grow Farms. The three classic Rs of going green (Reduce, Reuse, and Recycle) are now lifted to a new level by adding Renew and Rethink. Reduce waste, Reuse materials, Recycle trash…and explore Renewable Energy through Solar, Wind, Hydro, Geothermal, Tidal, and other paths such as waste to fuel via anaerobic digestion and hydrothermal carbonization. Rethink – All of the ways that we have done things in the past to find new opportunities for efficiency, growth and prosperity. This five point GREENandSAVE Strategy is at the heart of the business. The company’s website, GREENandSAVE.com, is one of America’s leading free "Green" resources for anyone who wants to save money and the environment, as well as create a healthier home, office, career and overall lifestyle. The company is the first to offer comprehensive Return on Investment (ROI) rankings and Take Action recommendations on multiple ways to "Go Green." The National Association of Realtors (NAR) used the GREENandSAVE data for their education curriculum, and the American Institute of Architects (AIA) also linked in to GREENandSAVE.com to educate their members. Mainstream and online media embrace GREENandSAVE as an industry leader. Publications ranging from the well established Washington Post to online insiders like the Huffington Post, have cited the top three resources on energy savings as: The Department of Energy, ENERGY STAR, and GREENandSAVE. In addition to the free online resources, GREENandSAVE provides next level services with an integrated approach to elevate consumers, businesses and institutions. For Consumers: GREENandSAVE provides Home Efficiency insights to individuals who want to save money on their utility bills. For individuals who want to embrace new careers in the exploding green marketplace, the GREENandSAVE Eco Academy provides professional training opportunities. The consumer services are supported by a network backbone of over five thousand home remodeling service providers across the country. For Businesses: GREENandSAVE provides Commercial Energy insights. We help educate real estate agents via "green guides" and promote agents and brokers to like-minded buyers and sellers via the company’s state-by-state directory. In addition to the Realtor Resources, the company’s Inspector Network promotes qualified Property Inspectors and Energy Auditors. For Institutions: The GREENandSAVE Eco Education curriculum for Grade School, Middle School, and High School students focuses on teaching science and math through in-class sustainability and take home projects. Beyond the support for The National Association of Realtors (NAR) and the American Institute of Architects (AIA), GREENandSAVE works with regional and local organizations. At the township and association level, the release of the Master GREEN Office Return on Investment (ROI) rankings has been developed specifically to support local Chambers of Commerce across the U.S. The GREENandSAVE Return on Investment (ROI) calculations are intended to serve as a guide to help you see the hierarchy of performance and payback. Given variations in energy consumption, house or office size, results will naturally vary. The calculations are based on comprehensive local and national research and a combination of reports from the U.S. Department of Energy, the EPA, ENERGY STAR® for Homes Program, US Green Building Council’s LEED for Homes and Office Programs, American Council for an Energy-Efficient Economy (ACEEE), International Energy Conservation Code, PLUS information directly from University Studies, Architects, Manufacturer Specifications, Distributors, seasoned Builders and Installers, and Home and Business owners with actual Performance Feedback. The Residential savings statistics are based on an average US home of 2,500 sq. ft. and the Office savings statistics are based on a small business 'module' with ten employees. This approach provides home and business decision makers the opportunity to 'scale' the results accordingly to match their properties. Our analysts, researchers, and writing team members continue to review products and performance data from a broad range of public and private sector reports as well as manufacturer specifications and actual user feedback. Our founder Charlie Szoradi, is an Architect and Leadership in Environmental Design (LEED) Accredited Professional, who wrote his Masters Thesis on Energy Intelligence "Eco-Humanism" in 1993 at the University of Pennsylvania. Prior to his graduate work, he completing his undergraduate studies at the University of Virginia. Mr. Szoradi is a three term elected board member of the Sustainable Business Network, a sough after speaker on sustainability, and the author of the book Learn from Looking. The book includes over two decades of his drawings and insights on sustainability from his travels around the world. Mr. Szoradi designed and built a groundbreaking solar house for his family outside of Philadelphia that was features in CISCO Systems documentary series, "One Million Acts of Green. "See the video profiles: Small Acts, Big Rewards and The Most Energy Efficient Home. GREENandSAVE has spearheaded the CleanTech for AMERICA movement. At its core, it is about creating new jobs and business opportunities over the course of building a stronger and more sustainable country in the new global Energy Economy. America rallied to fight for Independence over 200 years ago, and now we can rally for Energy Independence. #1: American Self-Reliance: We believe that our unalienable rights come with the responsibility to leverage the "powers of the earth," referenced in the Declaration of Independence, to their highest and best use so that America thrives in the new global Energy Economy. #2: American Jobs: We believe that that the breadth and scope of Clean Technology will become the foundation of a new Energy Revolution in the 21st Century just as mechanical automation became the foundation for the Industrial Revolution that shaped the 20th Century. With this change, comes an opportunity for Americans to intelligently train and re-think manufacturing and services to participate as creators as well as buyers of a whole new generation of consumer, business, and industrial products. #3: American Health: We believe that CleanTech is also about the process of making products with fewer toxins that we touch and digest. This form of preventive medicine in advance of a business or consumer sale may serve as a highly cost-effective solution over the lifecycle of products to reduce unforeseeable diseases and sick-building syndrome for ourselves and our children. #4: American Property Value: We believe that measurement is the key to management and American real estate offers an immediate platform to create efficiencies. According to the Department of Energy (DOE), buildings account for over 40% of all US energy consumption. It takes energy to make a new property but it saves energy to retrofit an existing one. We believe in Energy Auditing and scoring properties on operating costs per square foot to determine the most cost-effective paths forward. #5: American Transportation: We believe that America can create better fuel economy through clean diesel, initially championed by German automotive manufacturers, Hybrid Synergy, still led by Japanese corporations, and Plug-in Electric growing dramatically as battery technology improves. Hydrogen vehicle development also shows increasing promise. We also believe in a more robust development of "car share" and "ride share" carpool programs as well as mass transit and high speed rail where reasonably possible within Return on Investment targets. 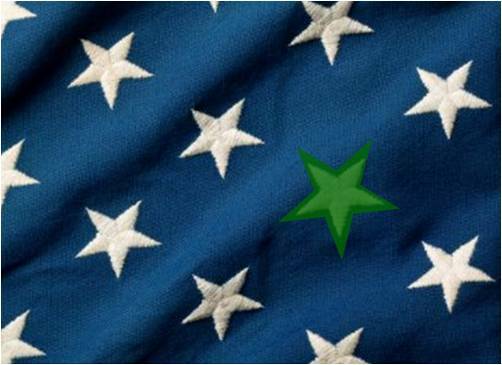 #6: American Five Star ‘R’s: We believe in the three founding ‘R’s of the early environmental movement: Reduce, Reuse, and Recycle, plus a fourth one for Renewable Energy and a fifth one for ‘Rethink’. Reduce waste, Reuse materials, Recycle trash…And: explore Renewable Energy through Solar, Wind, Hydro, Geothermal, Tidal, and other sources. Rethink – All of the ways that we have done things in the past to find new opportunities for efficiency, growth and prosperity. #7: American National Security: We believe that we need to focus on manufacturing and product development and Intellectual Property, because we are increasingly vulnerable to other countries. #8: American Energy Mix: We believe in a balance with multiple Renewable energy spokes in concert with traditional power supply and efforts to diminish the percentage of dependency from Coal, Offshore Oil, Natural Gas, and Nuclear. According to the Department of Energy (DOE), we use 25% of the world’s power with only 5% of the population, so we have to reduce wasted energy, but it will take a transition off of existing power supplies. #9: American Political Candidates & Legislation: We believe in supporting candidates that look beyond party ideology to find local, state, and national solutions with an eye on American job creation and long term sustainability. Beyond any candidate or public servant, we believe in supporting legislation that encourages American job creation and rewards CleanTech and Energy Smart performance, without handicapping corporations from growth. #10: American Stewardship: We believe in respecting the "laws of nature" referenced in the Declaration of Independence as they relate to human interaction with plants and animal life so that we strive to lead the world by example and coexist as better stewards of the environment for ourselves and future generations.